The Dundee Engine plant opened in October 2005. DETROIT -- Fiat Chrysler’s Dundee Engine Plant, which builds the automaker’s North American line of inline-four engines, has achieved silver status under FCA’s World Class Manufacturing system, the company said today. In doing so, the company’s newest engine plant joins Windsor Assembly as its only North American facilities to achieve its third-highest level for productivity, improved quality and safety. Based on the principle of eliminating waste of any kind, the World Class Manufacturing system relies on the input of line workers to suggest ways to improve their jobs and their plants. Plants are audited twice a year under a series of measurements and their status boiled down to a score on a 100-point scale. A score of 50 or above is recognized as bronze, 60 is silver, 70 is gold and 85 is world class. 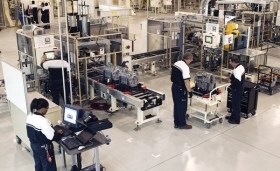 In North America, seven FCA plants have achieved bronze status: Toledo Assembly Complex in Toledo, Ohio; Trenton Engine Complex and Warren Stamping in suburban Detroit; Indiana Transmission Plant II and Kokomo Transmission in Indiana; and Saltillo Truck Assembly and Toluca Assembly in Mexico. Dundee Engine in Michigan opened in 2005 and produces 1.4-liter, 2.0-liter and 2.4-liter inline four-cylinder engines for Chrysler, Jeep, Dodge and Fiat vehicles.